I have to admit that I'm not too familiar with Milly's career. This is probably due to the fact that a lot of her older films are difficult to get a hold of. 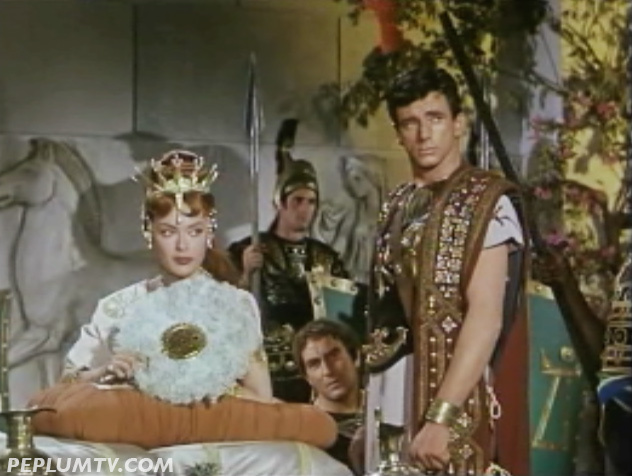 She made a couple of other PEPLUM films before this one, and they're hard to get, such as NERO & THE BURNING OF ROME (1953). REVAK would be her last film before returning to acting 8 years later, in 1968. She only appeared in 4 more films before retiring. So, the bulk of her career was almost pre-PEPLUM explosion. If I recall correctly, the only other movie I saw her in was WAR & PEACE (1956). There were a lot of actresses or celebs who were popular for a while, almost household names back then, appeared in a couple of PEPs, only to totally disappear from the spotlight. Like Abbe Lane or Yvonne Sanson. That's Richard Wyler standing next to Milly.